More than just a favourite of Victorian home entertainment, the stereoscope and the 3D images it created were also used in the field of science. Lydia Pyne explores how the French palaeontologist Marcellin Boule utilised the device in his groundbreaking monograph analysing one of the early-20th-century’s most significant archaeological discoveries – the Neanderthal skeleton of La Chapelle. 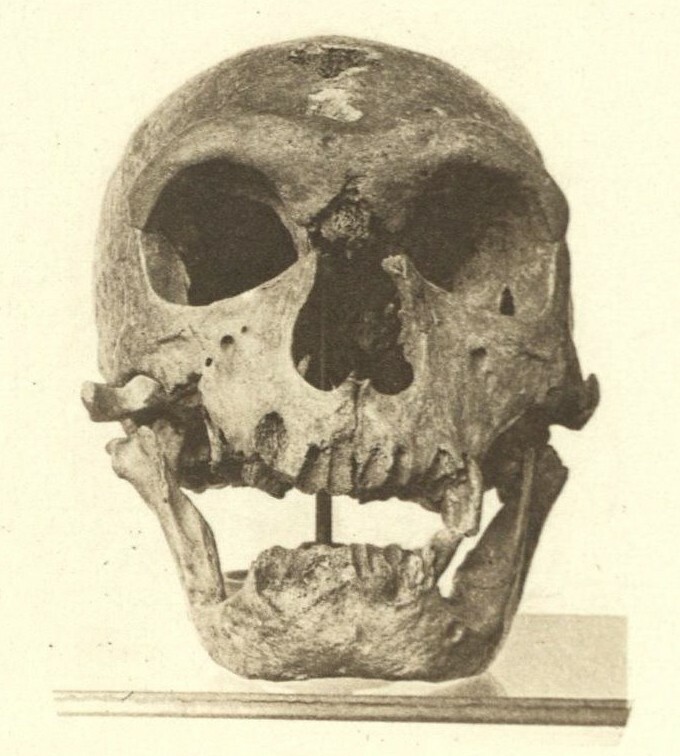 A neanderthal skull, left hand side of one of Boule’s stereographs included in his L’Homme de La Chapelle (1911) – Source: author’s scan. After the skeleton was excavated, the Bouyssonies sent the remains to the eminent Marcellin Boule, the Director of the Laboratory of Palaeontology at the prestigious Musée d’Histoire Naturelle in Paris. Boule conducted a two-year detailed anatomical study of the fossil that culminated in a hefty monograph, L’Homme Fossile de La Chapelle-aux-Saints, published in 1911. L’Homme was the first and most comprehensive publication of Neanderthal skeletal anatomy in scientific literature, establishing the La Chapelle skeleton as the most complete fossil reference for early paleo-studies. Boule’s detailed anatomical description of the skeleton provided a framework for any new Neanderthal fossils discovered and the 1911 reconstructions of La Chapelle became the basis for all subsequent Neanderthal research. It is filled with chapters of anatomical descriptions, careful measurements, photographs of the skeleton in the ground, prior to excavation, as well as sketches of geomorphic cross-sections from the cave. The book was and is a masterpiece: a complete anatomical and cultural summary of the La Chapelle Neanderthal, opening with the story of the fossil’s excavation and ending with comparisons to the few other turn-of-the-twentieth-century discovered Neanderthal specimens from across Europe. In addition to the tables of metrics and photographs of the La Chapelle fossil, Boule included another type of media that gave readers of L’Homme a way to interact with the fossil for themselves. 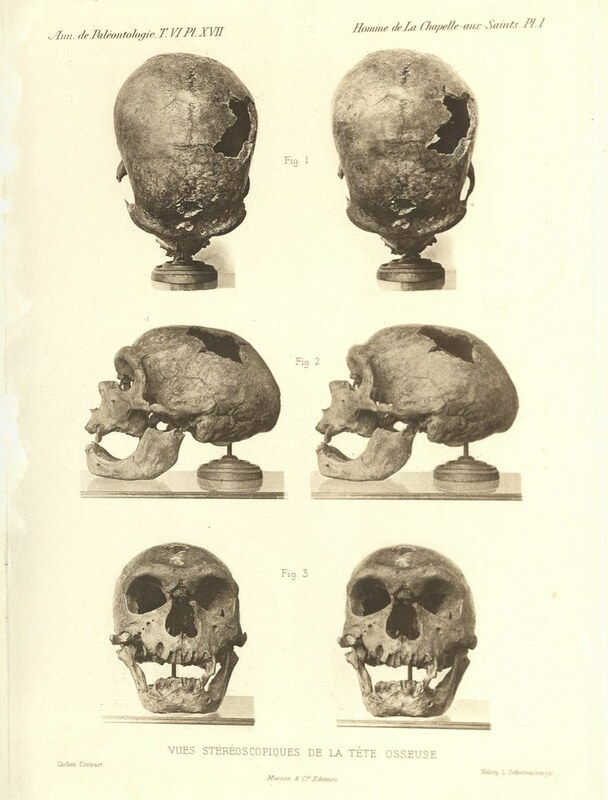 At the back of the book, Boule included six stereoscopic plates of the Neanderthal skull. By the time L’Homme was published the stereoscope would have been a familiar object, one of the many optical toys – along with kaleidoscopes, zoetropes and cameras – through which the nineteenth-century eye had peered in wonder. The stereoscope’s particular trick was to give a a two dimensional image an illusion of depth. Gazing through its viewfinder, the two slightly offset images of the stereoscopic plate, or stereogram, positioned in front would combine to create an illusion of three dimensions. 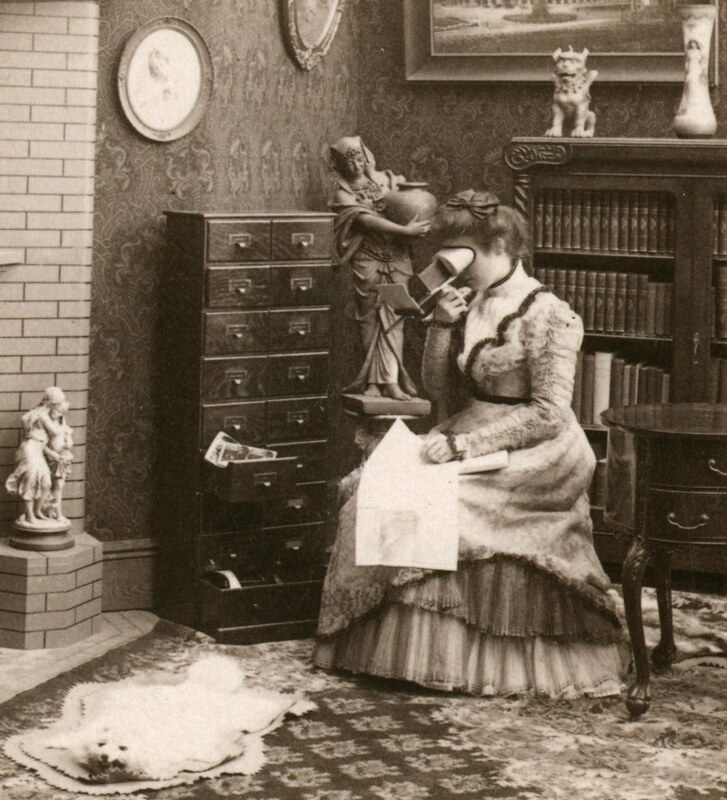 A stereograph from 1901 depicting a woman using a stereoscope, detail above – Source. The device, however, was much more than just a toy or illustrative distraction – it developed also into an important tool for laboratory and scientific work in the late nineteenth and early twentieth centuries. Just as telescopes and microscopes expanded what is visible, the stereoscope expanded what and how researchers were able to see different specimens. 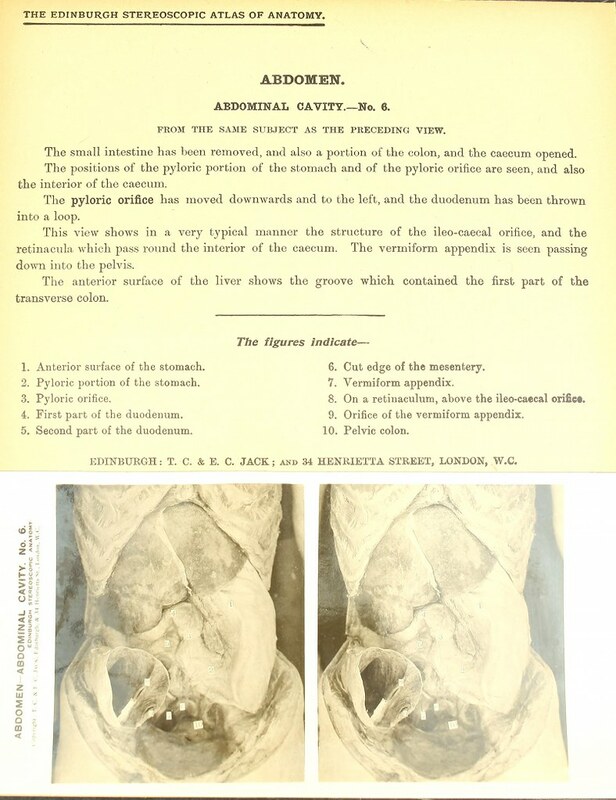 A plate from The Edinburgh Stereoscopic Atlas of Anatomy, from the section on the abdomen – Source. What worked for anatomists also worked for paleoanthropologists such as Boule. Indeed, early-twentieth-century paleoanthropology borrowed heavily in its method and theory from anatomy, and most researchers who studied fossils had a background in anatomy. In order to properly describe the anatomical characteristics of fossil material, researchers published tables of published tables of metrics and measurements which aided in comparisons between different groups of modern humans and great ape populations. Publications included photographs, sketches, and references to casts, any number of things that would let researchers see the fossil and how it compared with other anatomical specimens. As fossils were themselves too rare and important to send between researchers, proxies – casts, measurements, sketches, photographs, and highly detailed descriptions – were needed to provide accurate and sufficient information.3 Drawing from a tradition of stereoscopic anatomical atlases, the La Chapelle-aux-Saints Neanderthal plates gave the reader a first-person experience of interacting with the fossil in three dimensions. Under Boule’s careful direction, Monsieur J. Papoint of the Laboratoire de Paleontologie at the Musée d’Histoire Naturelle, contributed dozens of pen-and-ink illustrations to L’Homme – sketches of the skeleton as well as drawings of stone tools that were found in the original excavations. The six sterograms show the La Chapelle skull in every anatomical position: superior, anterior, lateral, everything. All of the stero cards were stamped with the publishing house (Masson & Cie Editeurs), and the plates credit Heliog L. Schutzenberger as the photographer. At 278 pages, Boule’s L’Homme was comprehensive, his anatomical comparisons thoughtful, and his research judiciously in keeping with other lengthy then-contemporary tomes of prehistory. The first three stereographs from Boule’s L’Homme de La Chapelle (1911) – Source: author’s scan. In the stereo cards, the skull is carefully situated on a shiny platform – the skull’s reflection gleams off the surface – and the fossil itself rests on a small metal and wood pedestal. The skull, however, is the only part of the Neanderthal skeleton to be photographed in stereoscopic view and the only element to have additional “props” (a pedestal and table.) Although the props would have been necessary to precisely line up the two images, they introduce a subtle laboratory rhetoric to the Neanderthal plates and L’Homme writ large. In this context, the Neanderthal skull is a scientific object that is seen only when it is propped up by other objects – a tableau which must be captured by the stereoscope to be read as an evolutionary text. The last three stereographs from Boule’s L’Homme de La Chapelle (1911) – Source: author’s scan. The stereoscopic plates included in L’Homme Fossile de La Chapelle-aux-Saints were in complete keeping with the instrumental value of the stereoscope and these images went a long way toward creating and legitimizing the La Chapelle Neanderthal as a taxonomic icon and “classic Neanderthal” in scientific and popular circles. In the decades after Boule’s publication of the La Chapelle Neanderthal, his interpretation of Neanderthals was quickly co-opted into the popular caricature of a slouchy, barbaric troglodyte. The Neanderthal, according to Boule, was a sad specimen of nature – an evolutionary dead-end, to put it most kindly. (This view was first put forward in L’Homme Fossile de La Chapelle-aux-Saints and solidified in later decades through Boule’s additional research.) Near the mid-twentieth century and on into the twenty-first, however, Boule’s research and interpretations of Neanderthals came under massive criticism and even ridicule. 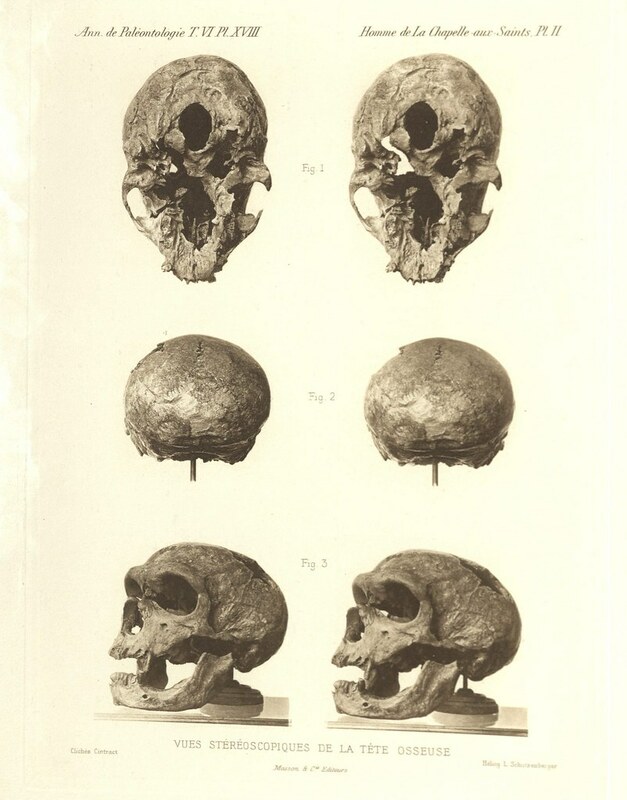 The stereo cards of the Neanderthal skull gave readers of the L’Homme Fossile de La Chapelle-aux-Saints the opportunity to see for themselves the complexity of the Neanderthal crania. This added dimensionality of the stereo cards helped bring the La Chapelle skeleton to the forefront of paleoanthropological research in the early twentieth century – the stereo plates deepened viewers’ connections to the fossil. (L’Homme’s beautifully detailed stereoscopic prints of each bone from the skeleton were the 1911 version of data sharing.) While it is easy to think of 3D rendering of fossils as a recent technological phenomena, stereograms offer a glimpse at the explanatory power of stereoscopic images and highlight the connections three-dimensional viewing made between viewer and object. Including stereoscopic images of the La Chapelle Neanderthal helped solidify the fossil’s iconic status in the early-twentieth-century paleoanthropology. Animated GIFs of the skull. An approximation for how the image would have looked in 3D. Thanks: The author would like to acknowledge the help of Dr. Sara J. Schechner, the David P. Wheatland Curator of the Collection of Historical Scientific Instruments, Department of the History of Science, Harvard University, for her insight and expertise. L’homme fossile de la Chapelle-aux-Saints (1909), by Marcellin Boule, (in Anthropologie, 1909, 19, p.519-525 – an article the went by the same name as his monograph to appear two years later). Fossil men : elements of human palaeontology (1923), by Marcellin Boule, translated by Jessie and James Ritchie. The Edinburgh Stereoscopic Atlas of Anatomy (1905), edited by David Waterson. Robert Silverman, “The Stereoscope and Photographic Depiction in the 19th Century,” Technology and Culture 34, no. 4 (October 1993): pp. 729. Lydia Pyne, “To Russia, With Love—Vol. 2, No. 4,” The Appendix. An exploration of how modern day humans came to be, interweaving the evolutionary story with its geologic backdrop, in a wonderful piece of scholarship bringing together of science and environmental history. Landau’s analyses of classic texts on evolution, from Darwin to more recent authors, reveal a common narrative of a humble hero figure who arrives at a higher, or in other words, more human state, after a journey involving tests and aid from others. From the Middle Ages to our modern times, this book explores the search for humanity’s origins.